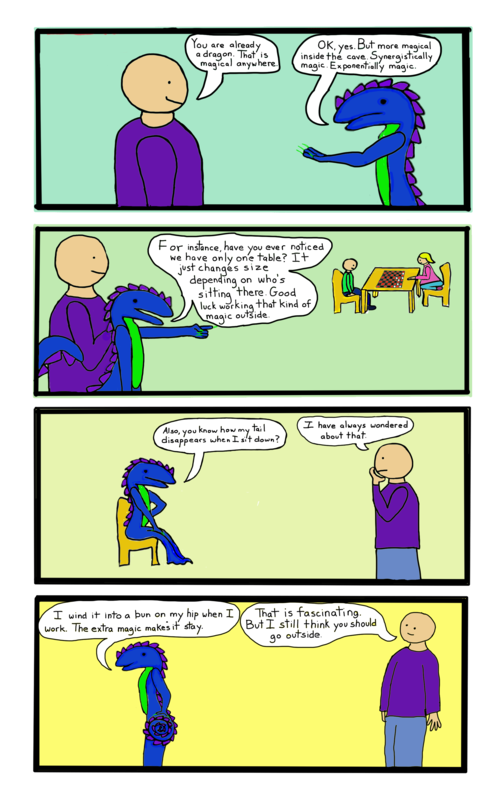 This is something I’ve been looking forward to doing for weeks and weeks, almost since I started drawing Dragon Comics. Are you not amused? In my defense, the rabbit is definitely getting cuter. And cut and paste is easier than trying to make the characters looks like the same characters every time. More or less, I was basically able to recreate what appeared in my mind when the idea came to me, which is progress. Still not perfect, but the main idea is communicated by the illustration, I think. I’m fairly pleased with the shattered glass effect in panel 4. It could use some more work, but, once again, the witching hour is at hand and the terms of my agreement with myself say that the comic goes up, perfection be damned. This kind of playing with meta perspective pleases me greatly, and it’s so well-suited to comics and cartoons. Probably the most extreme and well-known example of 4th wall breaking in animation would be the 1953 Chuck Jones Looney Tunes classic, “Duck Amuck,” in which the animator spends 7 minutes torturing Daffy Duck with inappropriate scenery changes, repeatedly erases him with a giant pencil wielded by an unseen hand, and, since this cartoon relies heavily on the viewer’s knowledge of trope, replaces an (open, functioning) parachute with an anvil. There’s always got to be an anvil. For an added bonus, the sketch ends by doubling the self-referential nature of the narrative while pushing it firmly back into place by revealing that the sadistic cartoonist is actually Bugs Bunny, screwing with his old nemesis Daffy. After establishing a refreshing commentary that reflects the separate world (reality) influencing the cartoon, the end sequence encloses the entire story back in the cartoon world. I could never be so cruel to my characters who, as you may realize, represent my actual loved ones, none of whom have even tried to convince a hunter that it was Dragon season. I just like to play. In fact, as I get older, that kind of classic cartoon violence-for-the-sake-of-violence makes me more and more uncomfortable. Apparently, some of us become gentler with age. That kid of cartoon violence is funny. It’s just not fair. I would rather wait 3 seasons to watch Aang spend 8 minutes fighting Firelord Ozai before defeating him with compassionate nonviolence than see any number of falling anvils. Don’t get me wrong; falling anvils are still hilarious. Epic storytelling is just more fun. Please note that even after the fourth wall has been completely shattered, The Man goes right on breaking it. He’s funny like that. 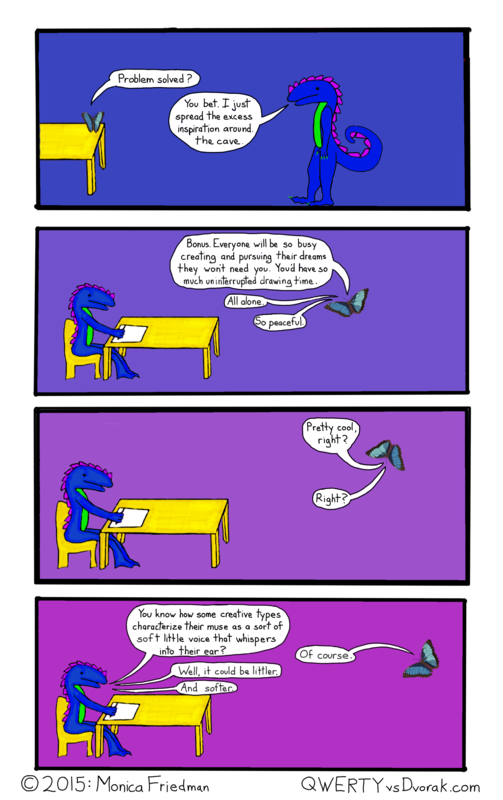 This entry was posted in Comics, Dragons, drawing and tagged broken, cartoon, cartooning, comic, dragon, drawing, fourth wall, glass, meta, skill, webcomic on October 29, 2014 by littledragonblue. Not that I precisely understand Facebook’s algorithms, but it seems pretty likely to me that Facebook doesn’t like it when you link to the same blog every single day. When I first started blogging, it seems like I actually got a lot more traffic, and a lot more Facebook likes. Now it’s leveled off, so my assumption is that Facebook isn’t showing my updates to as many people, which means fewer people are liking them, which means fewer people are seeing them. A vicious circle. Lacking a publicity budget and not being overly active on any other forums, it’s hard to see how to increase my reach. Unless my work is so great that everyone who reads it just naturally and organically shares it. OK: generate better work so that people just naturally like and share it. I *can* get better with practice. But do I? For most of my life, I was the type of person who either took immediately to a new skill, or gave up immediately on a new skill. It’s fortunate (or, possibly, the cause of this behavior) that I found myself naturally good at enough things that it was not immediately apparent that I was a quitter, or that I wasn’t learning certain important skills. (Seriously, I don’t think I knew my 12 times tables until college.) Not until my 30s did it ever seem imperative to me that subpar skills should be honed, that time should be spent doing things I wasn’t good at. 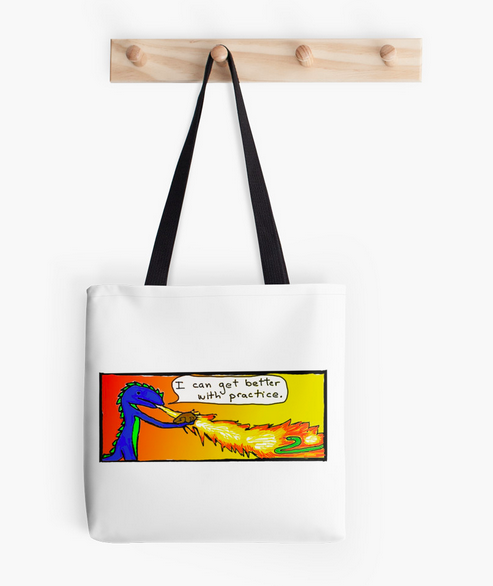 So the Dragon “I can get better with practice” comic still amuses me, and guides me. It can guide you too, if you carry it around with you at all times and refer to it for guidance in times of need. I stand by this princess. Getting better still isn’t a guarantee of success, which is another life lesson for me. Take Princess Sealestia of Aquastria. Although she’s a simple drawing, she took me about a month to complete, primarily because I had no idea what I was doing and had to learn the skills as I went. She still cracks me up. She still seems like a great idea to me. 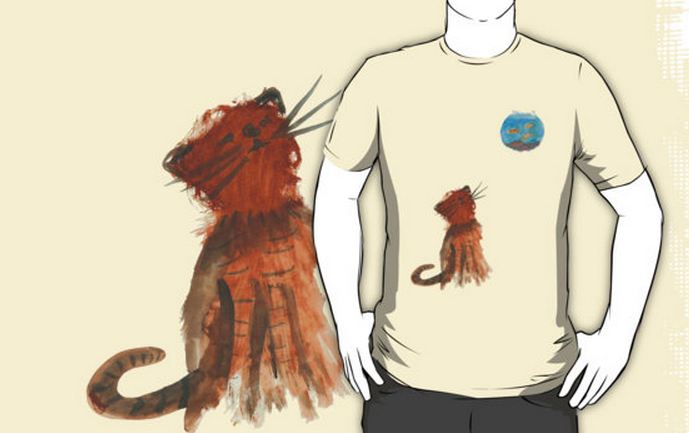 She gets more page views than any other design in my RedBubble shop. She gets compliments, too. But no one seems to want to take her home. Why not? She’s adorable. She’s available as a sticker for $2.32. That makes her versatile. She could be a smartphone case, or a notebook cover, or a window decal. That cat is never going to get tired of that fish. 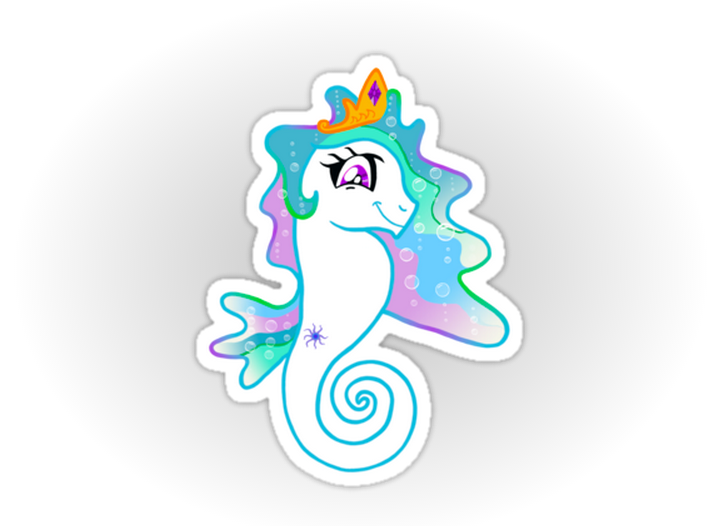 This entry was posted in art, Clothing, drawing and tagged animals, bag, cat, clothing, comic, dragon, fish, kitty, mlp, my little pony, seahorse, sticker, tote, tshirt on October 28, 2014 by littledragonblue. It’s true. He does smell delightful. 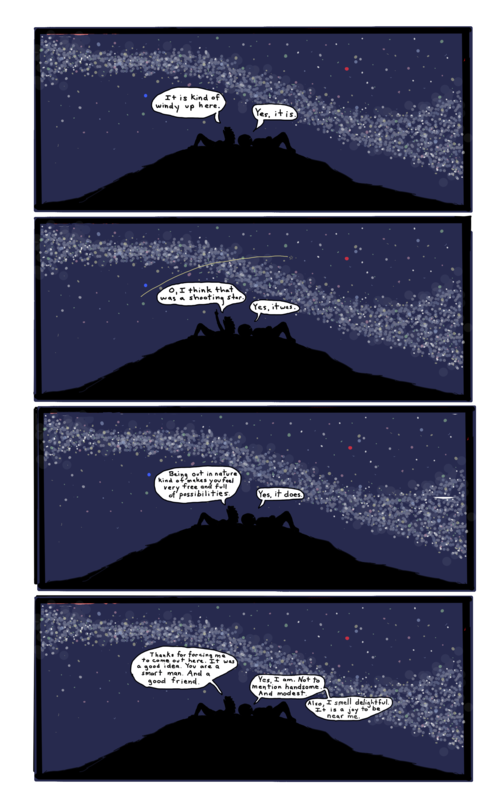 When I showed him the illustrations, before I added the text, he said, “I’m so glad you got outside.” Figuring out how to draw the Milky Way was the fun part of this drawing. Getting the silhouettes right was also something of a challenge, but not as much as it would have been 29 comics ago. In case you’re wondering where Dragon’s tail is, it is flat and limp without the cave’s magic, and therefore spilling down the hill with no curl whatsoever. In reality, I spend far too much time outside the cave. Why, just yesterday I went to 2 parties and 3 stores, and later found out that I missed an old friend passing through town due to my own busy-ness. And today I attended a Girl Scouts Brownies meeting for the first time since 1981. Fascinating. Getting the comic written is getting harder as the frantic part of the year encroaches, but I’m committed to at least 100 of them before I reevaluate. Like what you see? Why not support the artist by clicking on the blogroll links to your right? 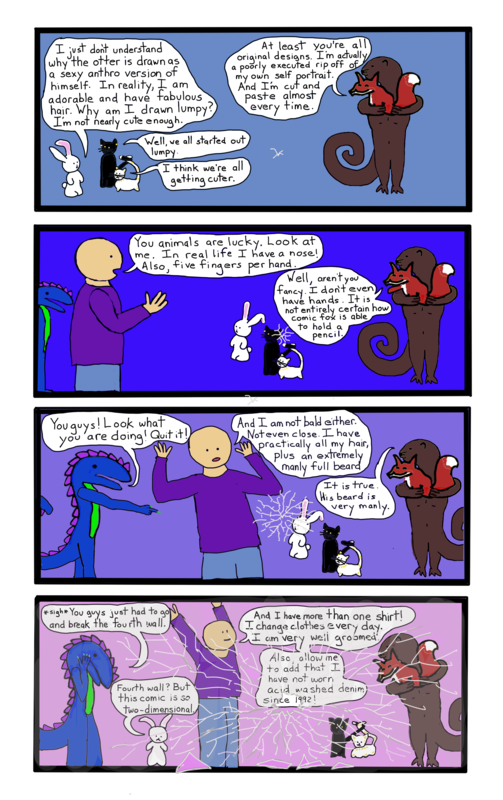 This entry was posted in Comics, Digital Paint, Dragons, drawing, nature and tagged comic, dragon, extravert, introvert, man, modest, outside, shooting star, webcomic on October 27, 2014 by littledragonblue. O my god I am so very very tired. We drove with the kids to the north rim of the Grand Canyon and back, stopping at every culturally significant landmark along the way, and my brain is sort of a humming white noise wrapped in a fine network of red pain. We ate up the state of Arizona, and it was delicious, but a meal that big is bound to give a dragon indigestion. Anyway, the idea of drawing or writing anything more complicated than what you’re seeing here is simply laughable. Look how committed I am! Updating the blog even though I may actually be asleep who even knows what is going on. This is for you, my beloved Internet. Love me! I love you! Please don’t reject me even though my drawing skills are questionable and ability to budget my time compromised. We did see bison at the north rim, a hundred of them, up close, maybe a couple of feet away from our open car windows (attempt at your own risk). We could hear them grunting and snuffling. We did not attempt to pet them. Although we were tempted. 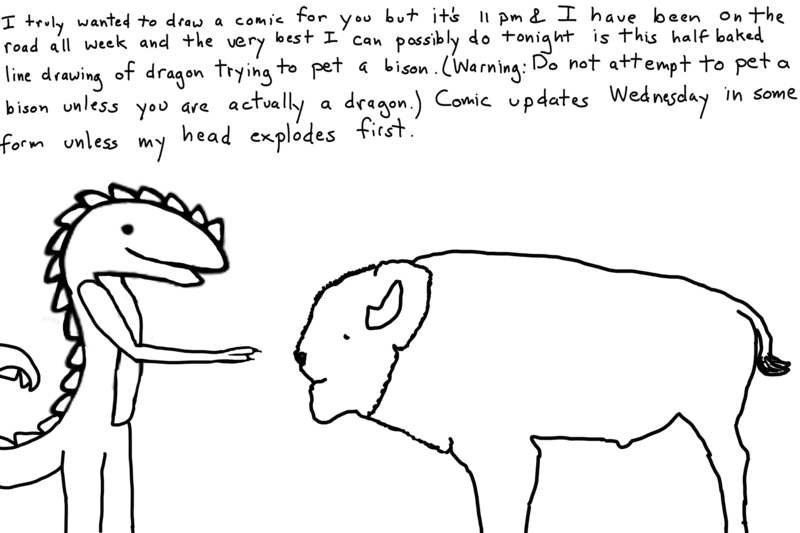 This entry was posted in Dragons, drawing and tagged badly drawn, bison, buffalo, dragon, excuses, tired on October 20, 2014 by littledragonblue.